This paper was prepared by the DAC Network on Gender Equality (GENDERNET), as an input to the DAC Network on Poverty Reduction's Task Team on Empowerment. It reviews why WEE matters, where donor money is going, specific challenges, suggestions for improving donor practice, and working in partnership for women's economic empowerment. Start with women by integrating gender-specific perspectives at the design stage of policy and programming. More equitable access to assets and services -- land, water, technology, innovation and credit, banking and financial services -- will strengthen women's rights, increase agricultural productivity, reduce hunger and promote economic growth. Infrastructure programmes should be designed to maximise poor women's and men's access to the benefits of roads, transportation services, telecommunications, energy and water. Women experience barriers in almost every aspect of work. Employment opportunities need to be improved. At the same time women perform the bulk of unpaid care work. This is an area for greater attention by development actors through increased recognition and valuing of the ways in which care work supports thriving economies. 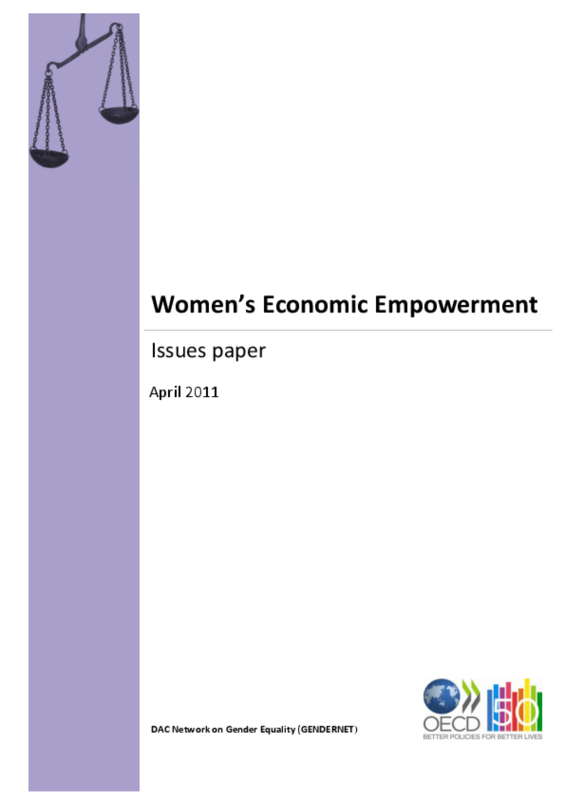 Innovative approaches and partnerships are needed to scale up women's economic empowerment. Women's economic empowerment is a prerequisite for sustainable development, pro-poor growth and the achievement of all the MDGs. At the same time it is about rights and equitable societies. There is scope for increasing donor investments in women's economic empowerment. Achieving women's economic empowerment is not a "quick fix". It will take sound public policies, a holistic approach and long-term commitment from all development actors.